The truth of the matter is that minimal space is a problem for many of us. And when storage is lacking, a mess is always close behind. We doubt that we're the only ones who have a chair covered in clothes by the end of the week, right? Nevertheless, a tidier space will help clear your mind and reduce your stress. So, ask yourself "what would Marie Kondo do?" and follow our eight dresser organizing ideas to give your tiny abode a little extra breathing room. Always start the organization process with a clean slate. Completely empty out your dresser and clean it from top to bottom. Go through each item of clothing and mark it as to keep, to sell, or to donate. Be ruthless. A purge every season will ensure that you're not holding on to unworn clothes that are taking up valuable space. Measure the interiors of your drawers and think through your needs. You might find that it's time to invest in a new dresser. If that's the case, a wide six-drawer option like this one from Target ($271.99) is always nice, or (if you don't have the square footage for something that wide) a tall and narrow unit like this gem from Anthropologie ($798) will work just as well. Alternatively, West Elm has a dresser/wardrobe combo ($1,399) that is a nice middle ground and will work wonders in a small bedroom. Once you have the right piece of furniture, the next dresser organizing idea is to look at your clothing and separate it into groups such as t-shirts, jeans, pajamas, socks, and undergarments. Assessing each group will help you determine how much space you'll need to dedicate to each category. Perhaps you can combine two groups to make more room for your collection of vintage Levi's. 4. Invest in drawer organizers. Organizers will help you divide the space in your dresser, keeping everything neatly arranged. They're great for smaller items such as underwear, socks, or accessories, but they also work with larger garments as well. You can repurpose empty boxes and containers lying around your house or you can purchase organizers and extendable plastic dividers. Marie Kondo even has her own range of beautifully designed storage boxes which sold out in a snap, but you can get similar options from retailers like The Container Store to get that Kondo-esque look. 5. Store bulkier items elsewhere. Forget about overstuffing your dresser. You need to be able to open and close the drawers with ease and make the most of limited space. Store bulkier items such as sweaters, sweats, and your assortment of colorful onesies in a wardrobe or perhaps in a bin under your bed. 6. Perfect your folding technique. When you are able to see all of your wares, you don't have to rifle through everything just to find your fave black tank top. 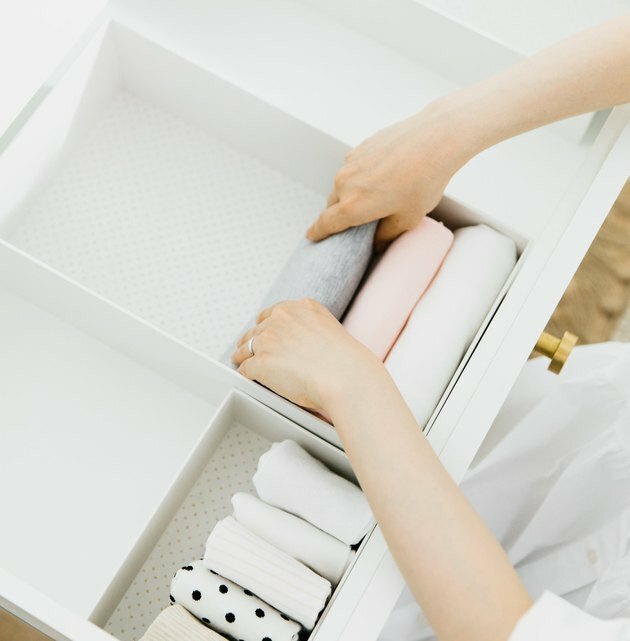 And nothing will help keep your drawers looking beautifully organized better than Kondo's folding method. But fair warning: There are different ways to fold each item of clothing, so do your research if you're a beginner. Opening your dresser should be exciting, not stressful. Have you thought about organizing your dresser drawers by color? This fun task will bring a vibrant rainbow to your bedroom, and it might even provide some insight into what you are, and definitely are not, missing from your wardrobe. 8. Style the top of your dresser, too. Now, it's time for the fun to really begin. We all know that it's what's on the inside that counts, but in this case, the outside is pretty neat, too. Think of the exterior as an extra layer of dresser organization, and decide what function it will serve. A vanity table? Bedside storage? Grab all of the pieces you think you want on the top of your dresser, and then carefully edit them down, so instead of looking messy and cluttered, it will look thoughtfully styled. 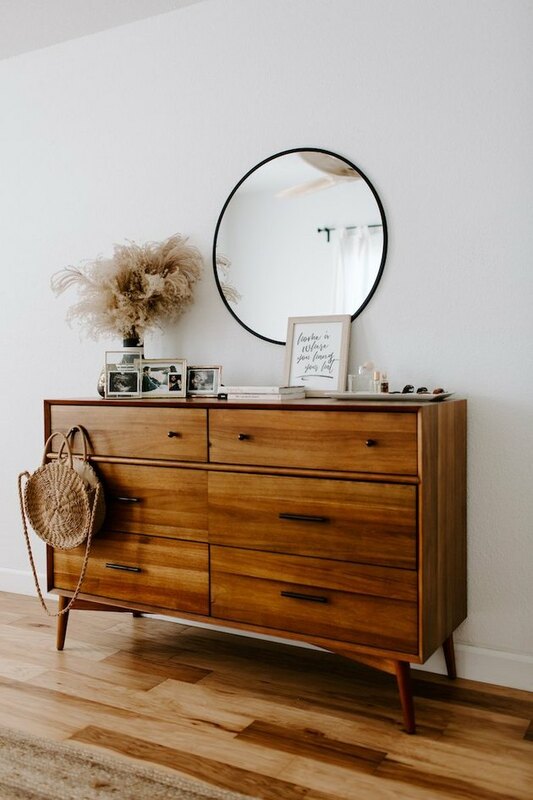 Take notes from blogger Kaylee Crane's artfully arranged bedroom dresser — she even uses a drawer knob as a purse hook.